Chelsea defender Ryan Bertrand will return to Norwich on loan next season after a successful spell last year. The 18-year-old left back will join until January and it is understood the Blues have agreed in principle to extend the loan over the whole season. Norwich manager Glenn Roeder told the club website: "I'm very, very happy to be able to bring him back, he had become a fans' favourite." The Canaries have brought the teenager in on an initial half-season loan deal. 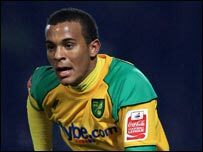 Bertrand played 18 games in the Championship for the Canaries and helped them to avoid relegation. The England Under-19 international originally joined Norwich in the January window and stayed with the Carrow Road outfit until the end of the season. With the Canaries back in pre-season training Roeder told BBC Radio Norfolk he was happy with the players on their return to the Colney training centre. He also confirmed the imminent appointment of a new fitness coach. "Alan Pearson has come in to head the fitness and strengthening part of the club. "I worked with Alan at West Ham, he made a big impression on me and the players then, and he's done the same here," he said. Roeder also revealed Bertrand was not the only one of last season's loan players he was hoping would return to Carrow Road. "Kieron Gibbs is a player for whom the season ended too soon, he was getting better by the week. "I would like to think after Arsenal's pre-season Arsene [Wenger] might like to let him come back here, we'll have to wait and see." Roeder confessed he was less hopeful of seeing Welsh international Ched Evans - a star of last season - back at Carrow Road. "It's going to be difficult to get him back here, I know he's gone away with the first team, Mark Hughes wants to have a look at all his young players. "As I understand it Ched Evans is not for sale, whether there's a chance of him coming back on loan, it depends what Mark thinks about him, he's a player I'd love to have back here."